In today’s “management by projects” mindset, portfolio managers and PMO directors are challenged with ensuring successful project delivery in addition to communicating and managing stakeholder needs across the organization. Portfolio managers struggle with communicating progress to executive leadership while trying to aggregate meaningful data from the project teams. Portfolio managers also seek to understand the work in progress without disrupting the project teams’ productivity yet need to respond to executive questions quickly. These are just some of portfolio management challenges portfolio managers and PMO directors face. "Project teams want to deliver. Portfolio managers want to help them deliver while supporting executive management with better decision-making. 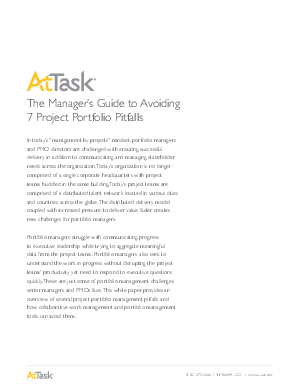 By integrating the tools and data used to support project delivery and portfolio management, a lot of these pitfalls are avoided. Analyzing and prioritizing candidate projects across a project portfolio can be achieved without an integrated solution, however the amount of administrative burden and associated headaches increases."